I have this in the slow cooker today. Cooked the rice last night so it came together super fast. Will report back on how it comes out! In large bowl, mix all ingredients except turkey. Cut turkey into slices at 1-inch intervals about three-fourths of the way through, forming deep pockets. 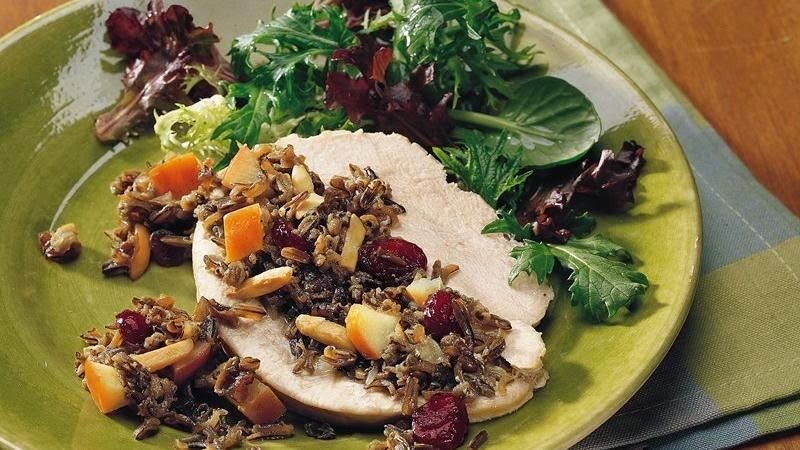 In 3- to 4-quart slow cooker, place turkey. Stuff pockets with wild rice mixture. Place remaining rice mixture around edge of slow cooker. Cover; cook on Low heat setting 8 to 9 hours or until juice of turkey is clear when center of thickest part is cut (170°F). Thermometer inserted in center of stuffing should read 165°F.